Koeman's men reached the semi-finals of the inaugural Nations League last year as Netherlands look to regroup after failing to qualify for the 2018 World Cup. And the Dutch boss expressed surprise that Netherlands' success in that competition was not enough to guarantee a place at Euro 2020. 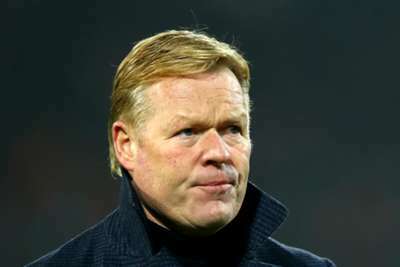 "The qualification for the Euros starts now," Koeman told reporters on Monday. "We couldn't make it even though we had a good Nations League. We know that. "Maybe it's odd that qualification starts in March and not in September. Our players are in a busy schedule at their club, fighting for the championship and so on. "We get them in after four months, and all teams are affected by this. I don't see it as a burden. Our players look happy to be back again. "Every player wants to win all the time. But now is the time. In qualification every mistake has consequences. Especially in our group with only eight games to play. We're starting our first two matches at home, so it's important to start positive." Memphis Depay has lost form at Lyon, scoring only once in Ligue 1 since November, but Koeman feels the 25-year-old - who has revealed he wants to leave the club - will welcome the change of scenery provided by international duty. "Indeed, he shows us that he's happy being back here at the national squad," Koeman added. "I've been in Lyon for Depay and Kenny Tete in December following the game against PSG. "I stayed a day longer to be at the training ground to spend more time with those two. And yes, we discussed some of those things. But that stays between us. "I must focus on the Dutch national squad and I'm pleased with his role in this squad. There's always room for improvement and so maybe he does feel different here than in Lyon. Let's hope he keeps feeling this way about the Dutch national squad. "He had his 'moments' with his position on the field. With us he plays as the central striker but at Lyon he also often plays as a winger. But he does have a lot of freedom as a winger, as I could see. Maybe that's something weird for him and maybe he's happier in the role that the Dutch squad has given him."